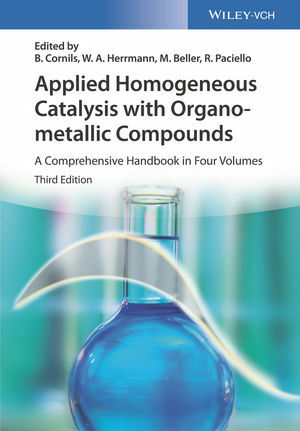 The completely revised third edition of this four-volume classic is fully updated and now includes such topics as as CH-activation and multicomponent reactions. It describes the most important reaction types, new methods and recent developments in catalysis. The internationally renowned editors and a plethora of international authors (including Nobel laureate R. Noyori) guarantee high quality content throughout the book. A "must read" for everyone in academia and industry working in this field. Boy Cornils has worked at the Ruhrchemie AG in Oberhausen, Germany, where homogeneous catalysis started with the hydroformylation reaction found by Otto Roelen, and with the former Hoechst AG in Frankfurt, Germany. In both locations he was director of the research. He is editor of several bestselling titles. Wolfgang A. Herrmann is president of the Technical University of Munich and has received several awards for his work in organometallic chemistry, like the Otto-Bayer Medal, the DFG Leibniz Award, the ACS Award in Organometallic Chemistry, Max Planck Research Award, the GDCh Wilhelm Klemm Award and many more. He has authored a plethora of publications and is the editor of numerous bestselling books. Matthias Beller is director of the Leibniz-Institute for Catalysis and Professor for Catalysis at the University of Rostock. He has received several awards such as the Otto-Roelen Medal, the DFG Leibniz Award, the first European Prize for Sustainable Chemistry, the Emil Fischer Medal and the Wöhler Prize of the German Chemical Society and the Gay-Lussac-Alexander-von-Humboldt Prize.